management and treatment options, including psychological therapy. In February 2015, the Standards of Care Committee of the British Society for Allergy and Clinical Immunology (BSACI) published the BSACI guideline for the management of chronic urticaria and angioedema (2nd edn).1 The guideline is based on evidence as well as expert opinion and is intended for both adult physicians and paediatricians practising in allergy. The majority of cases can be treated in primary care. The process by which BSACI produces its patient management guidelines has been accredited by NICE. See Table 1 (below) for the clinical classification of chronic urticaria/ angioedema. Some of these classifications may overlap, for example, a patient presenting with spontaneous urticaria may also have elements of dermographism. Adapted from: Powell R, Leech S, Till S et al. 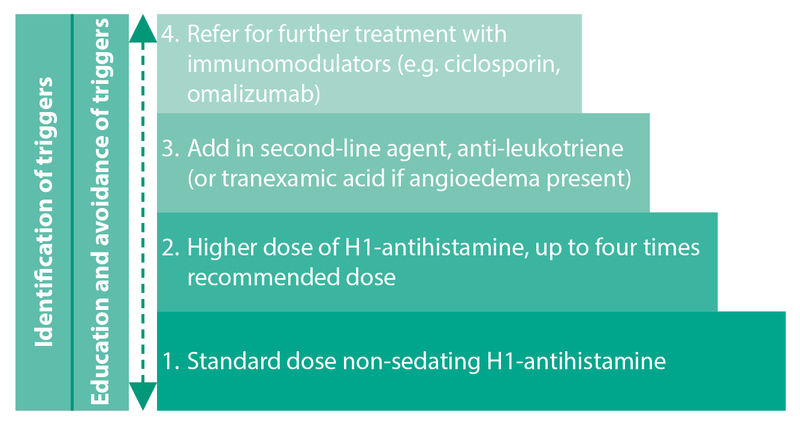 BSACI guideline for the management of chronic urticaria and angioedema. Clin Exp Allergy 2015; 45 (3): 547–565. cholinergic urticaria is triggered by sweating due to heat, emotion, or exercise. Inducible urticaria can be more resistant to antihistamines than spontaneous urticaria and follows a protracted course. Angiotensin-converting enzyme (ACE) inhibitors, hereditary angioedema (HAE), or acquired C1 inhibitor deficiency can induce angioedema without weals. signs of underlying disease, e.g. fever, significant malaise, arthralgia, hypertension, and blood or protein in urine. The lesions of urticarial vasculitis last for days rather than hours and leave a brownish stain. People with suspected vasculitis should be referred to secondary care. Infections. When present, chronic infections such as dental sepsis, sinusitis, urinary tract infections, and cutaneous fungal infections should be treated. Exhaustive investigations searching for infections are unhelpful.16Candida do not cause chronic urticaria. does the urticaria occur within 60 minutes (usually 20 minutes) of eating a particular food (with the exception of meat and crustaceans, e.g. prawn)? does it occur only if a particular food (e.g. wheat) has been eaten followed by exercise? does it occur after contact with an allergen to which the patient is sensitised (animals, grass, food, latex, etc.)? could it be caused by any drugs the patient has taken (ACE-inhibitor/aspirin/non-steroidal anti-inflammatory [NSAID])? In IgE-mediated food allergy, symptoms occur within 60 minutes of exposure and resolve within 24 hours, rather than coming on overnight or being present first thing in the morning. Oropharyngeal itching, wheezing, vomiting, or abdominal pain are usually present. Food additives, preservatives, and dyes rarely cause urticaria. Patients are often referred to allergy clinics in the mistaken belief that food is responsible. Atopy can be excluded by measuring serum-specific IgE or skin-prick testing to aeroallergens and suspect foods. Negative allergy tests may reassure the patient that their symptoms are not due to allergy and improve adherence to long-term antihistamines. The eosinophil count is elevated in some drug-induced reactions. An elevated neutrophil count may be present in urticarial vasculitis. The erythrocyte sedimentation rate (ESR) and/or C-reactive protein (CRP) is elevated in chronic infection and vasculitis. A high ESR with normal CRP may indicate paraproteinaemia. Patients with chronic urticaria may have anti-thyroid autoantibodies. Patients are often euthyroid but require monitoring. C4 and C1 inhibitor should be measured in patients with angioedema without weals. Complement studies are not indicated in patients with urticaria. C4 is usually low in types I and II HAE. Haematuria and proteinuria are present in urinary tract infections and renal vasculitis. Cold-induced urticaria can be diagnosed by placing an ice cube in a sealed plastic bag over the forearm for up to 10 minutes (allow skin to re-warm subsequently). Dermographism can be confirmed by lightly scratching the skin, with weals appearing within 10 minutes. The water test for aquagenic urticaria involves immersing a body part into water at 37ºC or placing wet towels for a few minutes on to the area of skin most affected. lesions lasting for more than 24 hours or associated with tenderness, petechiae, purpura, or skin staining as the lesions fade. Patients with unexplained pharyngeal obstruction should be referred for nasendoscopy. During an attack, direct visualisation of the pharynx/larynx establishes or excludes angioedema of the throat. Important differential diagnoses of 'swelling, lump, or discomfort in the throat' include globus, gastro-oesophageal reflux, and vocal cord dysfunction. Management of chronic urticaria includes the identification and exclusion of triggers, treatment of symptoms, patient education, and a personalised management plan (see Figure 1, below). short-term oral corticosteroid rescue treatment. The patient should be given advice on avoiding triggers, for example, cold or pressure (see Table 1, above). If the patient is taking a drug associated with chronic urticaria or angioedema (e.g. NSAID or ACE inhibitor), they should have a trial off treatment for several weeks. ACE inhibitors are contraindicated in angioedema. A stepwise approach to the treatment of chronic urticaria should be employed (see Figure 1, above). The starting point and rate of progression between steps depends on clinical severity and response. H1-antihistamines remain the mainstay of treatment; second generation antihistamines should be prescribed and are less sedating. Once-daily dosage improves adherence. To rapidly achieve optimal blood levels and relief of symptoms, the patient may take two tablets as the first dose, reverting to a single daily tablet thereafter. Individual responses and side-effects to antihistamines vary. For individuals with a long history of symptoms at presentation, treatment for 12 months is advised with gradual withdrawal over a period of weeks. Antihistamines should be withdrawn gradually rather than stopped abruptly. For patients with infrequent symptoms, treatment may be taken as required or prophylactically. First generation antihistamines (e.g. chlorphenamine) should be avoided because of sedation and interference with psychomotor performance. Although this may still occur with second generation antihistamines, it is less severe. Sedating antihistamines at night may help sleep. Psychological problems are common in people with chronic urticaria, arising before and following onset of symptoms.10 Psychotherapeutic treatments and behavioural interventions, such as cognitive behavioural therapy, may be beneficial. Patients unresponsive to high-dose antihistamines +/– LTRAs or tranexamic acid should be referred to secondary care. Patients with unexplained pharyngeal obstruction, patients with angioedema without weals and a family history of HAE or low levels of C4 or C1 inhibitor, and adults with suspected urticarial vasculitis should all be referred to secondary care for further assessment. Rescue medication may be needed in severe cases; details are listed below. Chronic urticaria is less common in children than in adults, and its management is very similar. The majority of children respond to treatment with antihistamines and avoidance of triggers. 22 Most cases are spontaneous and cold urticaria is the most commonly diagnosed induced urticaria. The physical appearance of weals and angioedema may cause concern to parents and carers, who perceive that the child is infectious or allergic, and keep them off school. The diagnosis is usually based on a detailed history and examination. Investigations are rarely required. There is little evidence to support the suggestion that urticaria is due to a reaction to foods or food additives. Chronic urticaria is a common condition which reduces the patient's quality of life. Diagnosis is based on the clinical history. Angioedema occurring in the absence of weals has a separate aetiology, and drugs and HAE should be considered in the differential diagnosis. Management involves identification and exclusion of triggers and management of symptoms, initially using antihistamines, the dose of which can be escalated. Treatment needs to be modified according to response and development of side-effects. Severe cases, suspected vasculitis or HAE should be referred to secondary care for further assessment. Symptoms in the majority of patients resolve over time and the majority of cases can be effectively managed in primary care. Local formularies should identify appropriate medications and their licensed doses and indications as well as where specialists advise their use out of normal licensed dose ranges (e.g. antihistamines). Powell R, Leech S, Till S et al . BSACI guideline for the management of chronic urticaria and angioedema. Clin Exp Allergy 2015; 45 (3): 547–565. Maurer M, Ortonne JP, Zuberbier T. 2009. Chronic urticaria: a patient survey on qualityof- life, treatment usage and doctor–patient relation. Allergy 2009; 64 (4): 581–588. Kaplan A. Clinical practice. Chronic urticaria and angioedema. N Engl J Med 2002; 346 (3): 175–179. Deacock S. An approach to the patient with urticaria. Clin Exp Immunol 2008; 153: 151–161. Humphreys F, Hunter J. The characteristics of urticaria in 390 patients. Br J Dermatol 1998;138 (4): 635–638. Toubi E, Kessel A, Avshovich N et al. Clinical and laboratory parameters in predicting chronic urticaria duration: a prospective study of 139 patients. Allergy 2004; 59 (8): 869–873. Leech S. Recurrent urticaria. Paediatrics and Child Health 2012; 22 (7): 281–286. Vleeming W, van Amsterdam J, Stricker B, de Wildt D. ACE inhibitor-induced angioedema. Incidence, prevention and management. Drug Saf 1998; 18 (3): 171–188. Kaplan A. C1 inhibitor deficiency: hereditary and acquired forms. J Investig Allergol Clin Immunol 2001; 11 (4): 211–219. Ben-Shoshan M, Blinderman I, Raz A. Psychosocial factors and chronic spontaneous urticaria: a systematic review. Allergy 2013; 68 (2): 131–141. Ricci G, Giannetti A, Belotti T et al. Allergy is not the main trigger of urticaria in children referred to the emergency room. J Eur Acad Dermatol Venereol 2010; 24 (11): 1347–1348. Özkan M, Oflaz S, Kocaman N et al. Psychiatric morbidity and quality of life in patients with chronic idiopathic urticaria. Ann Allergy Asthma Immunol 2007; 99 (1): 29–33. Staubach P, Dechene M, Metz M et al. High prevalence of mental disorders and emotional distress in patients with chronic spontaneous urticaria. Acta Derm Venereol 2011; 91 (5): 557–561. Torresani C, Bellafiore S, De Panfilis G. Chronic urticaria is usually associated with fibromyalgia syndrome. Acta Derm Venereol, 2009; 89 (4): 389–392. Chung M, Symons C, Gilliam J et al. The relationship between posttraumatic stress disorder, psychiatric comorbidity, and personality traits among patients with chronic idiopathic urticaria. Compr Psychiat 2010; 51 (1): 55–63. Kaplan A. Chronic urticaria: pathogenesis and treatment. J Allergy Clin Immunol 2004; 114 (3): 465–474. Jariwala S, Moday H, de Asis M et al. The Urticaria Severity Score: a sensitive questionnaire/index for monitoring response to therapy in patients with chronic urticaria.Ann Allergy Asthma Immunol 2009; 102 (6): 475–482. Staevska M, Popov T, Kralimarkova T, Lazarova C et al. The effectiveness of levocetirizine and desloratadine in up to 4 times conventional doses in difficult-to-treat urticaria. J Allergy Clin Immunol 2010; 125 (3): 676–682. Grob J, Auquier P, Dreyfus I, Ortonne J. How to prescribe antihistamines for chronic idiopathic urticaria: desloratadine daily vs PRN and quality of life. Allergy 2009; 64 (4): 605–612. Staevska M, Gugutkova M, Lazarova C et al. Night-time sedating H1-antihistamine increases daytime somnolence but not treatment efficacy in chronic spontaneous urticaria: a randomized controlled trial. Br J Dermatol 2014; 171 (1): 148–154. Leech S, Grattan C Lloyd K et al. The RCPCH care pathway for children with urticaria, angio-oedema or mastocytosis: an evidence and consensus based national approach. Arch Dis Child 2011: 96 (suppl 2): i34–37.